If there’s one thing that gaming enthusiasts can all agree on, it’s that a high quality display can be the defining factor that takes your gaming experience to the next level. Even with the whole set of the game consoles — or a gaming PC that’s the best that money can buy — without a screen that can do them justice, you’re not going to get to gaming nirvana. Thankfully, Samsung’s 2018 QLED TV range offers numerous features aimed squarely at gamers, meaning they’ve got the chops to achieve smoother and more vibrant gameplay than any competitor. There’s a number of important factors that gamers should consider when they’re on the hunt for a new television — the key ones being high resolution, fast refresh rates, low input lag, dedicated game-display modes and smooth motion. By directly addressing all those factors, Samsung’s QLED TVs have been engineered for brilliant gaming performance, providing gamers with the video settings that are truly important to them. Backed by unrivalled colour accuracy and picture modes specifically aimed to please gaming enthusiasts, Samsung’s 2018 QLED TVs are the perfect choice for games — not to mention movies, TV, sports and more. If you’re a passionate gamer who wants terrific video performance that enhances your gaming experience, then Samsung’s QLED televisions are here to make that happen. Here are four key reasons why you should consider a Samsung QLED set as your next gaming panel. Input lag is the time it takes for your button presses, keyboard strokes or mouse movements to register on your screen. There’s nothing more frustrating than a display that lags behind your commands, which can make the difference between victory and defeat. When it comes to rhythm-based games and twitch-focused competitive titles, every millisecond counts. Samsung’s 2018 QLED TV range has reduced the display technology’s input lag to just 15.4ms — a 26% improvement over last year’s already-excellent models, which registered an input lag of 21ms. With significantly reduced input lag, you won’t have to play at a disadvantage anymore. Stuttering and screen tearing can severely impact your gameplay experience, so it’s wise to consider picking up a display that has prevention measures in place, ensuring that your game time is as smooth as possible. Samsung’s 2018 QLEDs include new gaming capabilities that were once PC-exclusive features, such as support for AMD FreeSync and variable refresh rate (VRR) technology. With Microsoft’s Xbox One X and One S now compatible with FreeSync displays, you don’t need to hook up a gaming PC to your TV to see the benefits. So why are these new features important? Well, most televisions display images at a fixed refresh rate (such as 60 times per second), which often doesn’t exactly match the framerate that your games are running at. When that happens, this can cause the screen to try and display parts of two different frames at once, resulting in noticeable screen ‘tearing’ during gameplay. Samsung’s 2018 QLEDs now have the tech to do away with that problem, with every QLED TV in this year’s range meeting the HDMI 2.1 specification and supporting FreeSync and VRR technology — meaning these previously PC-only gaming smarts are now something you can enjoy from the comfort of your couch. Now more than ever, gamers are prioritising high frame rates over resolution when they’re playing competitive titles, which is why it’s imperative that their chosen display is up to the task. Every television in Samsung’s 2018 QLED range is capable of displaying imagery at up to 120 frames per second, meaning your games can move with incredible fluidity and quickness — so long as your console or gaming PC’s GPU can handle it, of course. On top of that, Samsung’s 2018 QLED TVs also offer Game Motion Plus — a new feature that creates intermediate frames to provide a number of image processing functions, including blur reduction, judder reduction and LED Clear Motion — the only trade-off being a slight (but acceptable) increase in input lag to 24ms when the mode is switched on. That’s a small price to play to not have to worry about jerky motion. First featured in last year’s QLED range, Samsung’s Auto Game Detection mode has been improved on all 2018 QLED TVs. 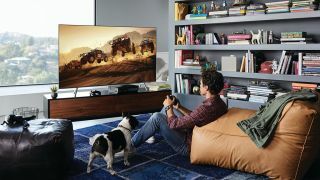 The mode, which is switched on by default, enables QLED TVs to detect when a Xbox One or PS4 console is connected, automatically switching the screen over to Samsung’s expertly-calibrated Game Mode picture setting. While on previous models there could be a slight delay before this feature would activate, Samsung’s 2018 models will now automatically detect and switch to Game Mode as soon as a game is launched. One of the dangers of gaming on a high-end television is the risk of on-screen menu and HUD elements leaving permanent marks on your display. Since the Quantum Dot materials used in QLED displays are completely inorganic, they aren’t susceptible to burn-in like other TV technologies, meaning you can game safely for hours on end without worrying about health bars and text becoming indefinitely etched into your screen. In fact, Samsung is so confident in its 2018 QLED TV range that it’s offering a 10-year no burn-in guarantee with every purchase. Game on! Samsung's 2018 family of QLED TVs are now available in Australia at selected online stores and retail partners. To discover the full range, visit the official Samsung QLED TV mini-site here. This article is proudly brought to you by Samsung Australia.